The RSM-CP is a Wireless Resettable Manual Call Point which features a simulated glass front. 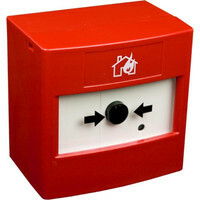 When activated, a plastic ‘flag' is displayed in the window of the unit; the supplied key will reset the flag and unit. The unit is supplied with a back box. Wireless resettable call point for indoor applications. Utilises standard low cost lithiumbattery technology.